Property price and feeling was good. It was well maintained. Good for singles or couples, not recommended with children. Nice pool, cafe restaurant are inside. The room service staff were polite and very quick. There was this staff Saddam who gave who was very excellent service. Rooms are newly renovated so everything ONLY looks clean. Location was good as easy access to the near by restaurants and to main road. Morning breakfast was good and the room service by restaurant was well. Parking 🅿, reciption people are kind and helpful, and location of the hotel 🏩. Short drive or walkable distance to a good Spinneys branch. Good onsite parking. Clean room. Good sleeper coach. Friendly staff. Nice pool. Value for money. Lock in a great price for Golden Sands Hotel Apartments – rated 8.1 by recent guests! 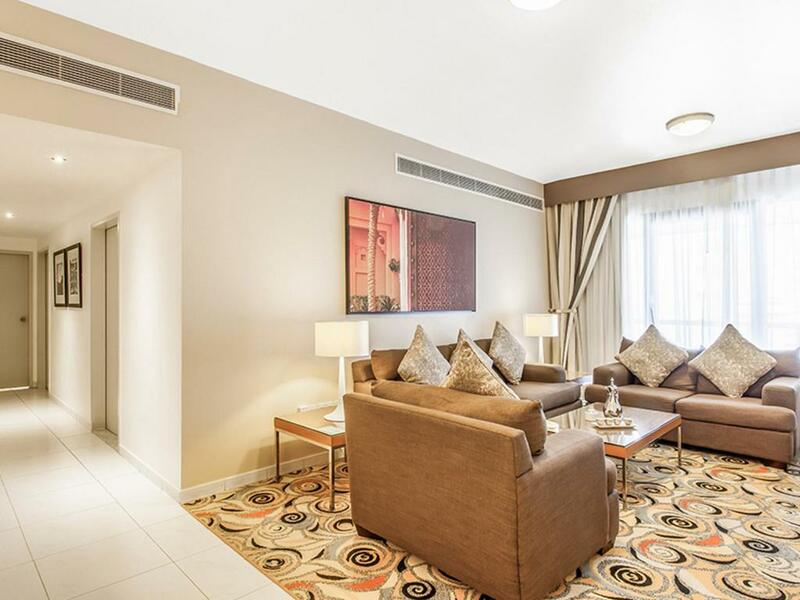 One of our top picks in Dubai.In Bur Dubai, Golden Sands is a large hotel apartment offering outdoor pool and free Wi-Fi. It is just 3 miles from Dubai World Trade Centre and a 15-minute walk from Burjuman Shopping Mall and ADCB Metro Station. Golden Sands Hotel Apartments include daily housekeeping and room service. Each unit includes a kitchenette and a washing machine. They also have a sitting area with a flat-screen TV and satellite channels. Guests can grab a snack and relax by the pool or indulge in a hearty meal at Golden Sands’ restaurant. Fitness facilities include gym and racquetball court and sauna. The tour desk can arrange excursions and car rental. 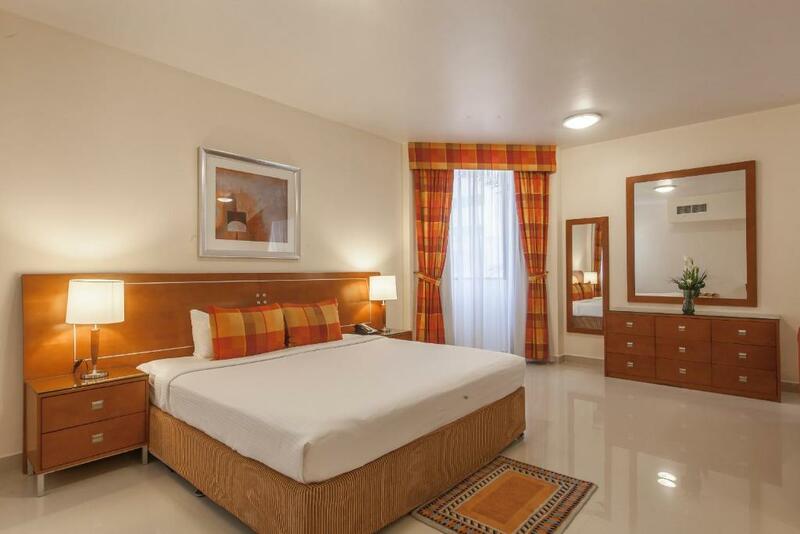 When would you like to stay at Golden Sands Hotel Apartments? 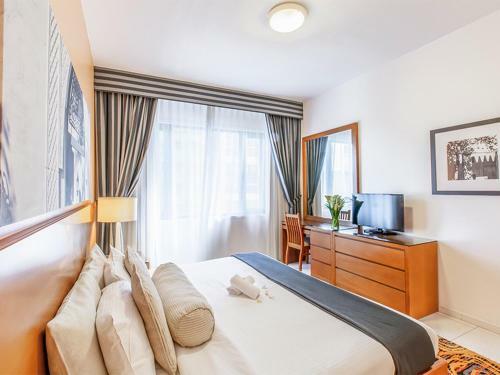 Featuring free WiFi, this suite includes a separate bedroom and an open plan living area with a double bed. 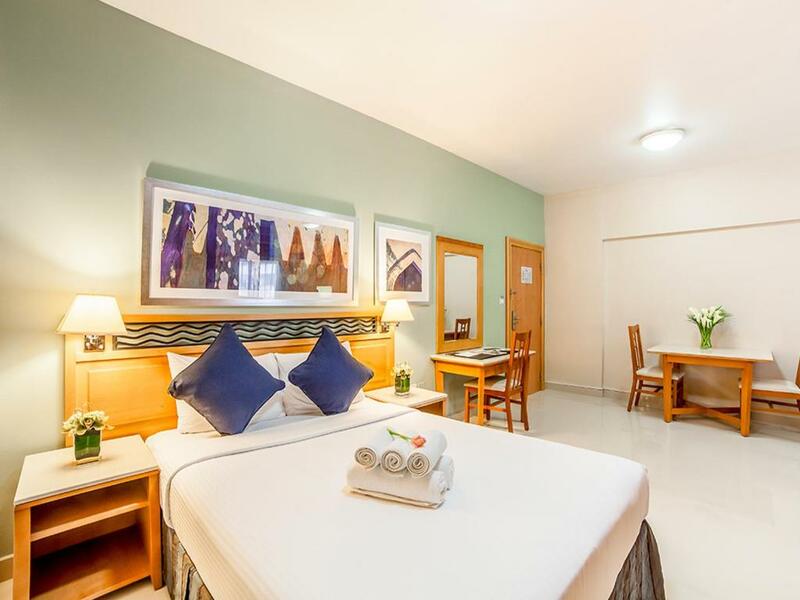 It offers free internet and is located in Golden Sands 3. Featuring free WiFi, this spacious apartment has free internet. It is located in Golden Sands 10 and includes 2 bedrooms and a separate living area. Featuring free WiFi, this spacious apartment is located in Golden Sands 10 and includes 3 bedrooms and a separate living area. Free Wi-Fi is available. 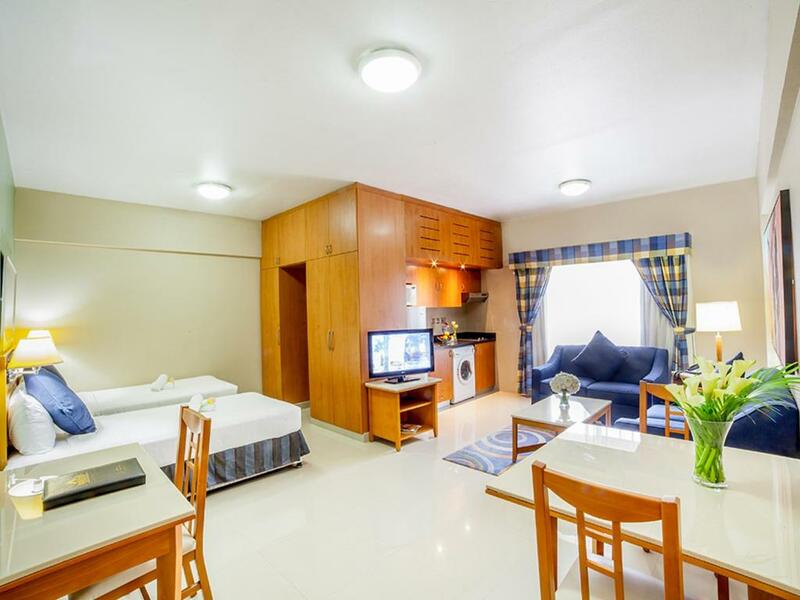 Featuring free WiFi, this One-Bedroom Suite is located at Block Golden Sands 3. Please note that the capacity is 2 Adults + 1 Child under 12 years. 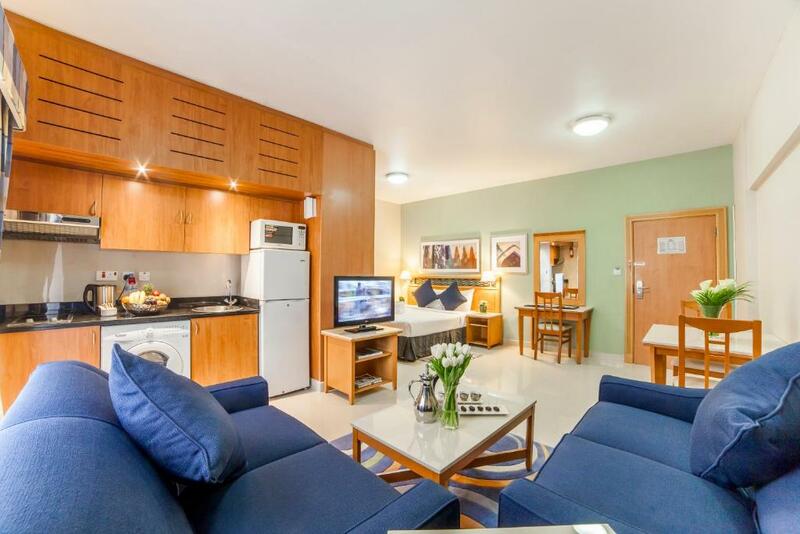 Located in Golden Sands 10, this apartment features free Wi-Fi, includes a separate living area with a flat-screen TV, a dining area and an equipped kitchenette. The bathroom is fitted with a shower and complimentary toiletries. Added facilities include free car parking, guaranteed late check-out until 14:00 hour(can be extended till 16:00subject to availability), and complimentary welcome fruit basket. Featuring free WiFi, this suite features a balcony, electric kettle and sofa. It offers access to the Executive Lounge. • Located on the fourth floor and open from 06.00am until 10.00pm. • Breakfast from 07:00AM to 11:00AM. • A selection of daily newspapers and magazines is available. • Computers with printing facilities. • Complimentary coffee/tea throughout the day. • A selection of home-made cakes and cookies can be enjoyed from 12:00noon to 05:30PM. • Light snacks can also be enjoyed from 06:00PM to 10:00PM. • The All Day dining Restaurant menu is also available at a surcharge. • Complimentary Wi-Fi is also available in the room along with complimentary late check-out till 4 pm – subject to hotel availability. • Guests can invite their guests in the Executive Lounge – surcharge apply. • Executive Lounge is open exclusively to guests staying with Executive Lounge access at Golden Sands Hotel Apartments. • Children under the age of 12 years are strictly not allowed in the Executive Lounge. Featuring free WiFi, this studio has a balcony, seating area and electric kettle. 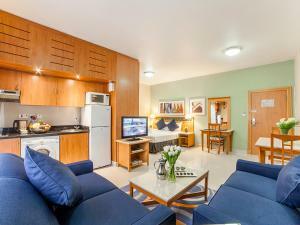 Featuring free WiFi, this studio features a balcony, seating area and washing machine. Featuring free WiFi, this room features a balcony, electric kettle and sofa. It offers access to the Executive Lounge. • Continental Breakfast from 07:00AM to 11:00AM. Golden Sands Hotel Apartments offer all services and facilities just like a deluxe hotel, although categorized as Budget Hotel Apartments. 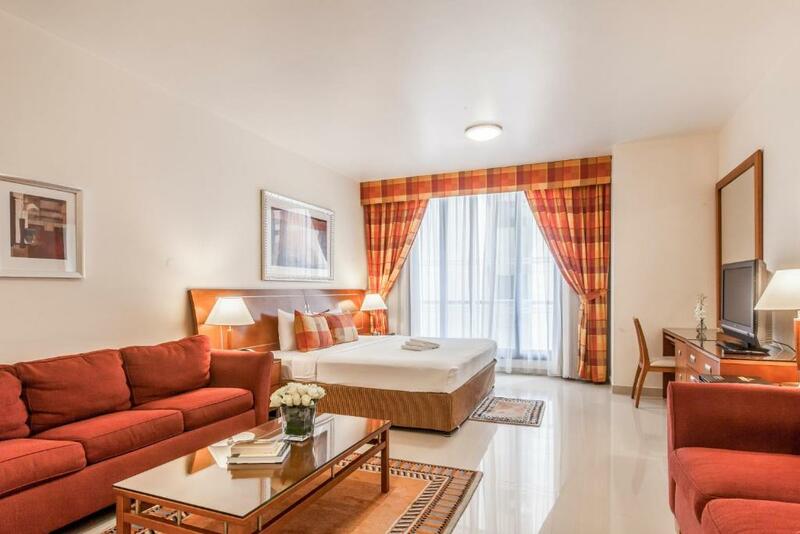 They are located downtown city centre, in the heart of Bur Dubai, very close to shopping, heritage sites, banks, consulates, metro and the exhibition centre. Area Info – This neighborhood is a great choice for travelers interested in sightseeing, tourist attractions and shopping – Check location Good location – show map Guests loved walking around the neighborhood! House Rules Golden Sands Hotel Apartments takes special requests – add in the next step! Golden Sands Hotel Apartments accepts these cards and reserves the right to temporarily hold an amount prior to arrival. Please note that the property only accepts credit cards, not debit cards. Please note that the hotel does not accept third party payment. Credit card used at the time of booking needs to be presented at check in. Please note that the guest credit card will be pre-authorized prior to arrival for all bookings with standard cancellation policy. For nonrefundable bookings, credit cards will be charged at the time of booking. Given credit card must belong to the traveling guest. Kindly note that visitors are not allowed in the room. A damage deposit of AED 600 is required upon arrival – that's about 163.35USD. This deposit is fully refundable at check-out as long as there's been no damage to the property. Blower is only available in one room and it was attached in the drawer. Staffs are nice especially the room boy named Konda, very kind and helpful during our stay. The cleanliness of the apartment was not great. Cutlery was very dirty (they did replace them), shower area and toilet were not great, and in general the windows, balcony door and oven door could have been cleaned beforehand. Additionally, in the write up when I booked, it states a "City View" and chocolate/cookies provided. There was no view other than the apartment block opposite, and there was no biscuits in sight. The apartment was spacious, and had all the facilities in it that we required. Close to local shop etc. Staff were friendly and helpful. Beds are very hard not so comfortable. Woke up very stiff and in pain. Paid for 3 people for breakfast. Bad idea. Eggs tasted like rubber. No frying station . There food comes from outside. Croissant were stale, tea had a bad taste. They cater for South Indian visitors more. Complained to the front desk but got a shrug of the shoulder only saying “we will take your opinion into consideration.” What does that mean??????? Booked a 3 bedroom apt. Saw the pictures on line and they were exactly the same. Came few months before just to make sure the booking and the rooms were up to standard. Very clean and spacious rooms. We were 5 adults so having 3 bathrooms was wonderful. We didn’t cook in there but we could have. There was a washing machine and a drier too. Very handy. Attention to detail with cleaning. The bathrooms were clearly used before me, with hairs all over the bath and sink areas. The 'King size bed' was literally 2 large singles pushed together... Not what I paid for! Advertised as a 5 star hotel, but fell way short of my expectations. The whole apartment had a standard feeling to it. Cupboards were bare with very little crockery, utensils or cookware. All flooring was tiled. Even in the bedrooms. The workers insist on you giving them money because they've shown you where your room is. Breakfast was bland. Missing a lot of continental menu items. I didn't dare use the pool or jacuzzi. Easy access to the metro and nearby mall. Spacious rooms. Great for a lads holiday, but not for a family. I wouldn't bring my partner here. Breakfast was very average. Not much selection and the eggs were like rubber. Terrible coffee. We booked this extra night and told we could upgrade on check in. That was not a possibility when we re-checked in. Not a problem - just disappointing. Sharp knife would have been appreciated. Easy check in & it was very early morning. We were shown our room and how everything worked, as well as given information on the local area. Quiet area. Easy to get transport.